Looking for Lizards in the Valley of Fire – Sounds psychadelic – something Jim Morrison might come up with. old pics 143, originally uploaded by Mic2006. Maggie and I won a free trip to Las Vegas some time ago. We rented a car and drove up the side of Lake Mead into the valley of fire. Amongst the more memorable experiences were my being chased by wild mules after mistakenly agravating them (Long story – my fault) and also trying to coerce Maggie from tipping over rocks and looking for lizards. She first spotted them at a road side fireworks, guns and alchol place. We had wandered out around the surrounding contryside with a bottle of tequila to observe the litter of old pyrotechnics and everywhere there were things that moved and skittered for cover under the rocks. My concern was her upending a rock and coming face to face with a rattler. 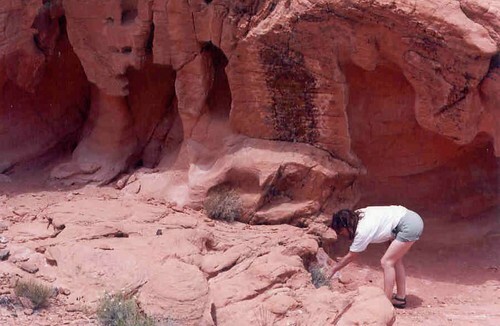 In the above photo Maggie continues her “critter spotting” practices in an area of worn red sandstone. It is this red hue that the area derives its name from – “Valley of Fire”.